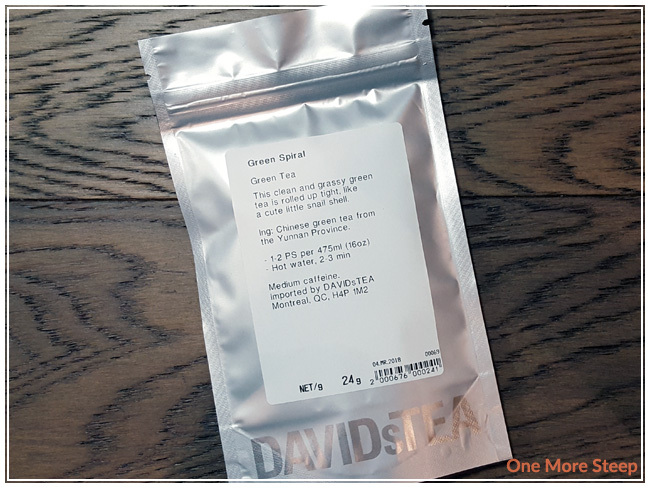 Green Spiral is the last of the trio of DavidsTea’s latest straight tea offerings. This Chinese green tea, which comes from the Yunnan Province, came to me in a resealable silver bag as I had purchased it in store. The tea leaves are rolled up, although not uniform in size or shape. The multi coloured dried tea leaves have a grassy aroma. In the description of Green Spiral, DavidsTea suggests that the tea is rolled up “like a cute little snail shell”. 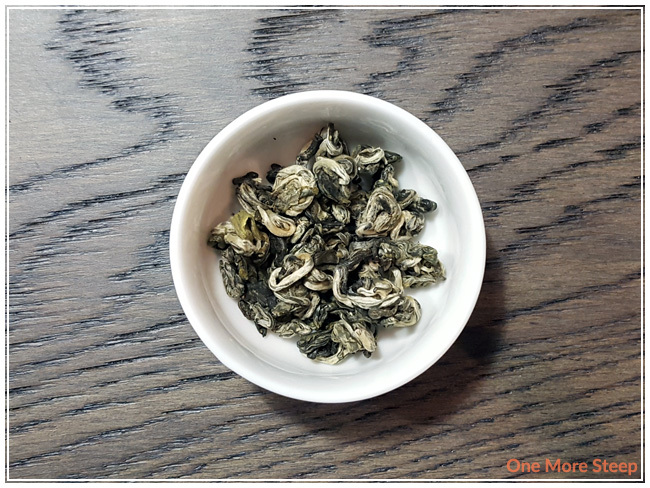 If you know Chinese green teas, you’ll know that this describes biluochun, a tea with a name that translates to green snail spring. DavidsTea recommends steeping Green Spiral in hot water for 2 to 3 minutes, where “hot water” is specified on their product page as being 75-80°C (167-176°F). I did an initial steep of Green Spiral at 175°F, which is the green tea setting for my Breville IQ Kettle, for 2 minutes. Green Spiral steeps to a pale yellow. The aroma that comes up from the steeped tea is grassy. On first taste, I note that there’s a grassy flavour, with a slight sweetness that lingers at the end of each sip. The tea is smooth, and has a nice mouthfeel to it. There’s nothing unpleasant about this tea, but also nothing that really makes it stand out in my mind either. I did pour some of this tea into a glass and tucked it into the fridge. It makes for a nice refreshing glass of iced tea as well, if you’re wanting a iced green tea as the weather (finally!) warms up. I resteeped Green Spiral four times and enjoyed watching the leaves open up more and more with each steep. 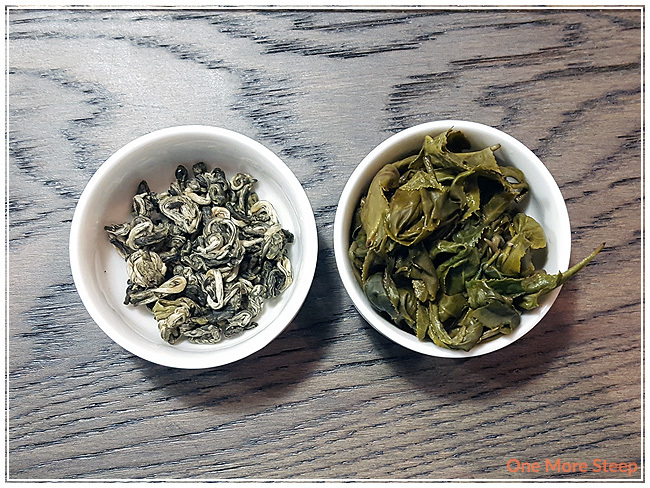 The flavour was stronger for the first resteep, and slowly began to wane with each subsequent steep. Overall, the flavour balance remained constant and was a pleasant cup of green tea. I liked DavidsTea’s Green Spiral. This green tea resteeped well, and had a lovely grassy flavour to it. The one thing really stopping me from wanting to keep a big bag of this tea in my tea stash is the fact that it doesn’t really stand out for me. 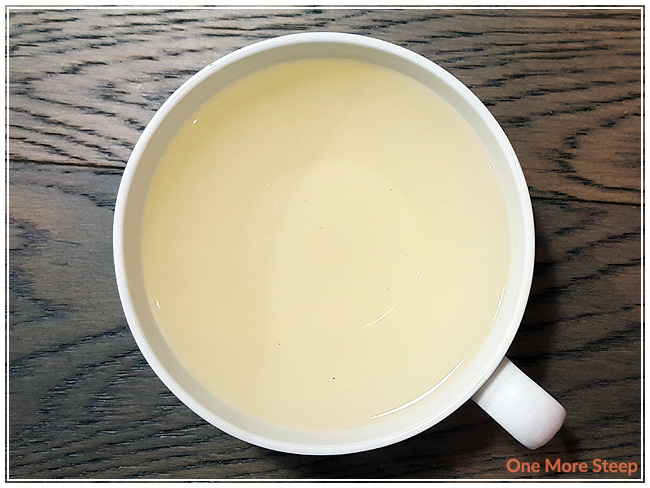 There’s so many green teas out there that are equally good, but this one is also on the slightly more expensive side (in comparison) and it’s not wowing me over to want to keep it on hand. 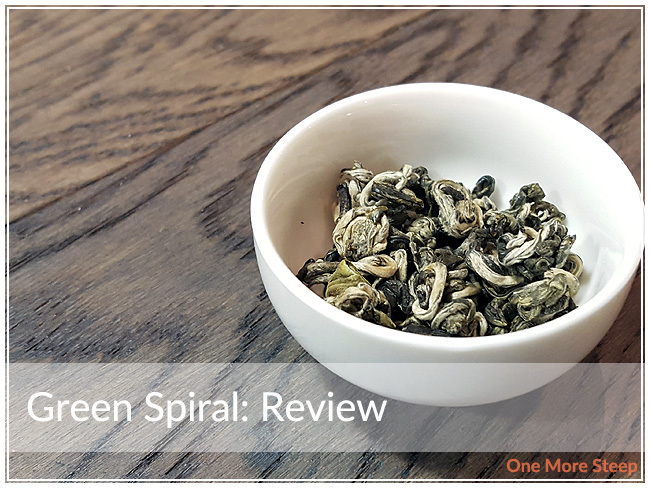 That said, if you’re wanting to try a good quality green tea, Green Spiral does fall into that category and it resteeps very well, so you know you can definitely get your money’s worth with this green tea.